The Parallax BASIC Stamp micro-controller has generated enthusiasm in the electronics industry, where it has twice been nominated EDN Product of the Year. The family of BASIC Stamps is growing. It started with the BS2 original with the green mask seen at the right in the bottom row in the middle. Each new addition to the family adds new features and capabilities for either speed or low power operations. BS2 original 2k program memory, PIC microcontroller. 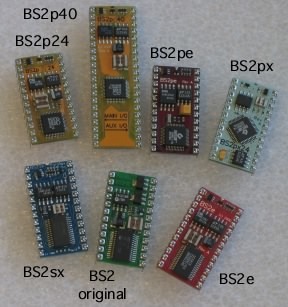 BS2sx, 2.5 times the speed, 16k program memory, 64 byte scratchpad RAM, SX28 microcontroller. available in both -24 and -40 pin versions based on turbo SX48 microcontroller. BS2pe, like '2p. but low power consumption, 16kbytes extra memory, optimized for data logging. BS2px, like '2p, but more speed, added configuration and comparator commands. The BASIC Stamp is popular among professional engineers, educators and hobbyists alike. In this index you will find links to notes I have written about the Stamps. I add to and change the material from time to time as I find new ways to do things. I enjoy hearing if you find these pages helpful or, please, if you find bugs I've missed. To the left, OWL2pe data logger. This is based on the OEM BASIC Stamp 2pe-40 chip, which is the 48 pin chip toward the upper left in the photo. In addition to the functionality of the Stamp 2pe, the data logger also includes a real time clock, battery backed RAM, a 12-bit, 11 channel analog to digital converter, 1/2 megabyte of flash memory for data logging, power supplies and protection for the inputs and outputs. Some environmental sensors require an Analog to Digital convertor, while other sensors connect directly to the BASIC Stamp II input pins. Both types are represented here. I have endeavored to use a minimum of external hardware, to make best use of the BASIC Stamp capabilities and to optimize the software routines. The purpose of these document is to provide information about how to connect different kinds of sensors to the OWL2pe data logger, or to the BASIC Stamp generally. 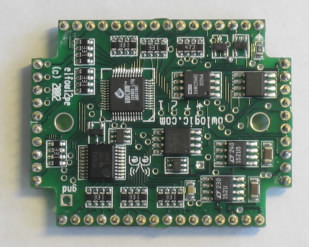 Some kinds of sensors such as the LM34 temperature sensor are analog and need to be connected to an analog to digital converter input, such as the TLC2543 found on the OWL2pe. Other kinds of sensors attach directly to the versitile Stamp io pins, to measure time intervals, frequencies, counts, etc.. Examples of this type of sensor are the rain gage, the anemometer or the digital barometer. This document shows how to transform and display the data in the proper units and most economically store it in memory, and give hints about other issues that arise in appication of the sensors. These techniques have both hardware and software components. I have endevoured to develop techniques that use a minimum of external hardware (such as in the case of the rain gage), and software routines that run efficiently and minimize the required code space. In the BS2 I was always running near the full program capacity of the BS2 and had to prune and prune to minimize the code. Some of the program requirements might seem a bit unusual, but in the context of scientific research, you can run into some pretty odd setups, odd timing and odd data processing. Light level, using the LI-COR scientific sensors, Pyranometer, Quantum PAR, and Photometer. Water level, using Unidata encoder cable and float system, or the capacitive gage, or the SDI-12 instruments. Some of the BASIC Stamp math operators are familiar, but others may seem strange at first. Even simple addition, subtraction and multiplication must be done with care, to avoid overflowing the 16 bit integer word, and simple division can easily lead to bogus results. People expect answers as if from a push-button calculator. Forget it! The BASIC Stamp calls for "work-arounds" and "insight". I enjoy this kind of puzzle, and I hope you will too. At least the results. It is a recipe book, and a tutorial on how to know if the recipe will work in a given situation. Here the application notes are broken into several HTML documents loosely organized by topic. Topics on multiplying a variable times a constant fraction, sensor calibration. Functions: the square root, arccos & arctan, logarithm, and interpolation. Calculation and display: Negatives, Decimals, Time and Date, IF-THEN-LET. Statistical calculations and digital filtering. statistics: mean, min, max, and S.D. division, where the denominator is a compile time constant. division of a double precision number by 10,100,1000, 60 and arbitrary. What is a COordinate Rotation DIgital Computer, and what does it have to do with the Stamp? Command Central. Here you will find technical notes that describe the operation of Stamp commands in more detail than is to be found in the Parallax manuals. How to avoid pitfalls and bugs. Details of how the commands really work. Application articles. Weird stuff. nitty gritty details of how it works and its timing. how to use flow control, master-slave scenarios, timing data, a bug, how to use a modem with the Stamp. table of power supply currents. encoders, games, keypad scanner, inside look at the button command. How fast will a BS2 (or SX or e) program take to run? the SLEEP bug, brownout bug, other things that can go bump in the night. Up to 8 megabytes of flash memory, SPI interface, plus lots of RAM too. IrDA infrared protocol is used by Palm and WinCE computers for shortrange wireless. The MAX3100 is a UART that provides buffering for input data, as well as IrDA drive. I am proud to have written this curriculum for the Parallax "Stamps-in-Class" program. This series is meant for advanced high school students or college students in science or engineering, who want exposure to how microcontrollers can be used in environmental sciences. The Stamps-in-Class web site describes this and other curricula, all free for download. The following files in PDF format are available from this web site. Lesson 1 shows how to use a piezo transducer for audio feedback, and then moves on to use the debug command to display readings from a DS1620 temperature transducer. The serial communication between the BASIC Stamp and the temperature transducer is explained in detail. User interface, and a "talking thermometer"
This lesson adds a pushbutton and teaches how to program it to respond to a single click, double click or long click, and how to store data in eeprom. The pushbutton, sound transducer and the temperature sensor are combined to make a "talking thermometer" using Morse code. Lesson 3 adds another temperature sensor to the mix, this one a small AD590 sensor constructed and waterproofed on a long cable so that it can be extended out to probe microenvironments. The BASIC Stamp reads the temperature using the RCtime command. The sensor is calibrated using an ice bath and checked against the DS1620 digital sensor. This lesson explains a photodiode as a linear light detector, and uses it to explore the huge range of light in the environment. Again, the text deals with principles and math of calibration. The data is logged into memory, and means are provided to record several data points and to play them back later. The liquid environment, water conductance and level. Lesson 5 deals with the liquid environment, namely, how to measure conductivity and water depth. An LMC555 timer circuit is justified to provide AC excitation to the electrodes. The program uses the count command and presents the data using ascii graphics on the debug screen. Measurement and control, a water pump and data logger. This final lesson adds an element of control to the system. A pump controlled by the BASIC Stamp fills a cup, and feedback from the conductance sensor is used to set a level under computer control. The final project monitors two temperatures, light level, and water level and controls the water level by turning the pump on and off. The AD590 is the chip used in the probe for unit 4 of Earth Measurement, and the note describes how to construct the probe. Sometimes the AD592 chip is hard to get, so the other two notes descibe substitute parts and how to make them into probes. The TMP17 comes in an SO8 package The LM334 is an older part, but it is always available at a low price. Any of these probes will output ~1 microamp per Kelvin temperature. Guia del Estudiante para Experimentos 1 al 6. También apéndices para Mediciones Ambientales 3 meg. This is the Spanish language translation of the Earth Measurements series, by Aristedes Alvarez of Argentina. Thank you, Aristedes!